The Lexington-Fayette, KY Metropolitan Statistical Area is the 106th largest Metropolitan Statistical Area (MSA) in the United States. 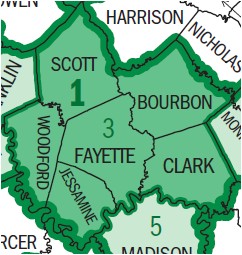 It was originally formed by the United States Census Bureau in 1950 and consisted solely of Fayette County until 1980 when surrounding counties saw increases in their population densities and the number of their residents employed within Lexington-Fayette, which led to them meeting Census criteria to be added to the MSA. The Lexington-Fayette, KY MSA is the primary MSA of the Lexington-Fayette–Richmond–Frankfort, KY Combined Statistical Area which includes the Micropolitan Statistical Areas of Frankfort, KY (Franklin and Anderson counties), Mount Sterling, KY (Montgomery, Bath, and Menifee counties), and Richmond–Berea, KY (Madison and Rockcastle counties). The Lexington-Fayette–Frankfort–Richmond, KY Combined Statistical Area has a July 1, 2012 Census Bureau estimated population of 703,271. • Populations are based on published estimates by the United States Bureau of the Census. ¹County was not a part of Lexington-Fayette, KY MSA at the time of this Census and the county's population is not included in MSA total. ^ "Table 1. Annual Estimates of the Population of Metropolitan and Micropolitan Statistical Areas: April 1, 2010 to July 1, 2012" (CSV). 2012 Population Estimates. United States Census Bureau, Population Division. March 2013. http://www.census.gov/popest/data/metro/totals/2012/tables/CBSA-EST2012-01.csv. Retrieved 2013-06-05. ^ "Table 2. Annual Estimates of the Population of Combined Statistical Areas: April 1, 2010 to July 1, 2012" (CSV). 2012 Population Estimates. United States Census Bureau, Population Division. March 2013. http://www.census.gov/popest/data/metro/totals/2012/tables/CBSA-EST2012-02.csv. Retrieved 2013-06-05. ^ "City and Town Totals: Vintage 2011". United States Census Bureau. July 1, 2011. https://www.census.gov/popest/data/cities/totals/2011/index.html. Retrieved March 27, 2013. ^ "About Metropolitan and Micropolitan Statistical Areas". United States Census Bureau. February 28, 2013. http://www.census.gov/population/metro/about/. Retrieved June 5, 2013. This page uses content from the English language Wikipedia. The original content was at Lexington-Fayette, KY Metropolitan Statistical Area. The list of authors can be seen in the page history. As with this Familypedia wiki, the content of Wikipedia is available under the Creative Commons License.